Editor's note: Isa Soares is a Quest Means Business producer. Follow her on Twitter. Quest Means Business is presented by CNN's foremost international business correspondent Richard Quest. Follow him on Twitter and watch Quest Means Business on CNN, 0700pm GMT weekdays. Davos, Switzerland (CNN) -- Walk the halls of Davos and you're bound to bump into celebrities, heads of state and even princes and princesses. This is where you can be seen, be heard and be indulged. The World Economic Forum's little white book which provides contacts for each attendee is the best business bible around. But you don't need to hang around the halls or wait to stake out your favorite executive to get their contact. The best way to network here is to take the shuttle. It's free, it's warm and -- being Swiss -- it always arrives on time. Inside, the six-seater bus has been made for interaction, with passengers facing each other. With eye to eye contact and closed doors, they are forced to engage in conversation. I have been taking the shuttle since Saturday, and on each occasion, I have made small talk with the passengers. South African actress Charlize Theron picked up the 2013 World Economic Forum Crystal Award for her humanitarian work. The Oscar winner reportedly said: "There is such incredible brain trust in this room I feel I'm getting smarter by osmosis." 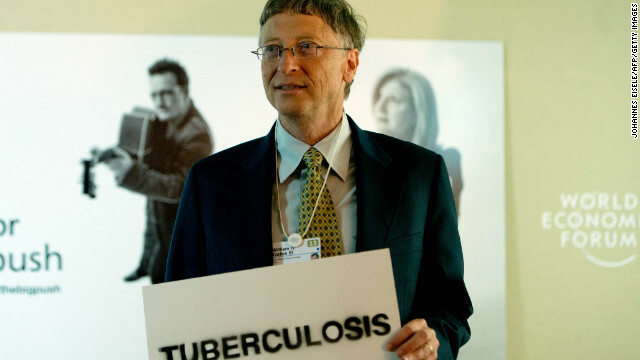 Microsoft co-founder turned global philanthropist Bill Gates was in town to promote the Global Fund against HIV/Aids, Tuberculosis and Malaria campaign. 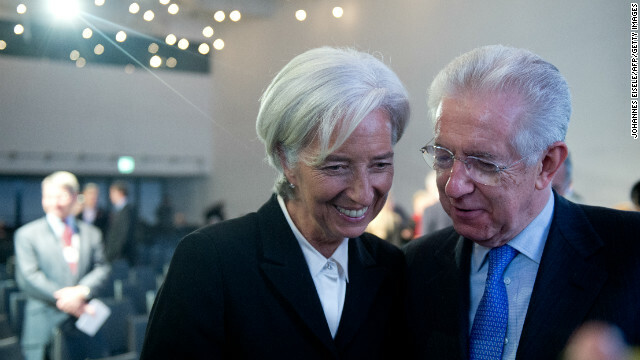 IMF boss Christine Lagarde and Italy's outgoing Prime Minister Mario Monti having a presumably good chat during the forum. A Davos meeting wouldn't be complete without a good protest. 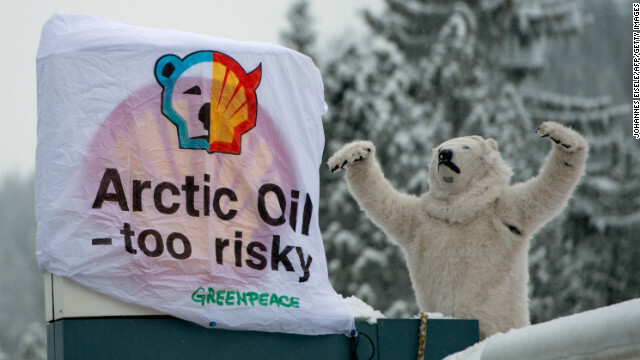 On the second to last day of the forum a Greenpeace activist dressed as a polar bear climbed the roof of a gas station to protest against global oil giant Shell. 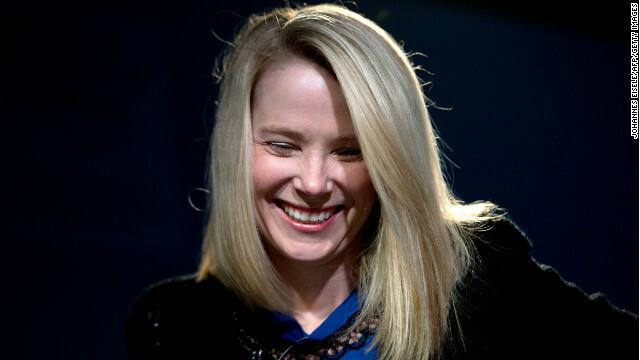 Marissa Mayer, CEO of Yahoo!, is all smiles during her session at the World Economic Forum. 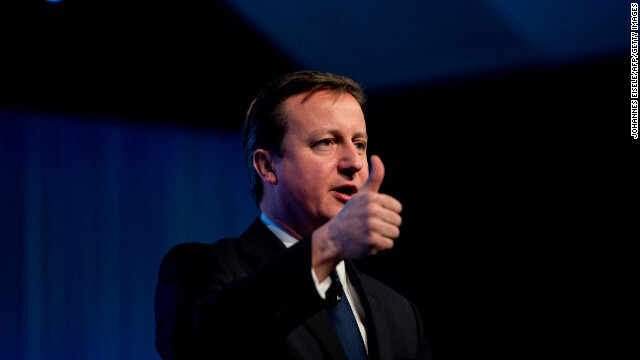 British Prime Minister David Cameron gives the thumbs up on during his talk at the annual World Economic Forum. Cameron said that Britain was not turning its back on Europe, after angering his EU partners by announcing plans for a referendum on membership. 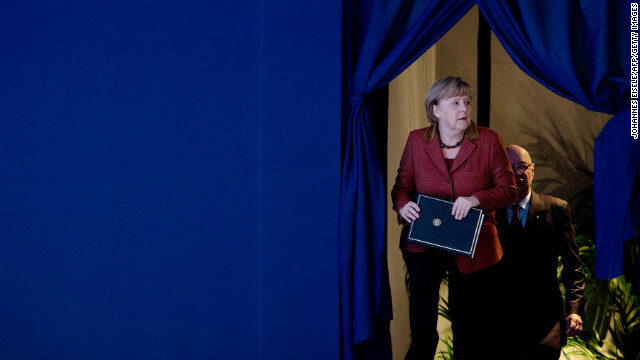 German Chancellor Angela Merkel arrives for her session on January 24, 2013. 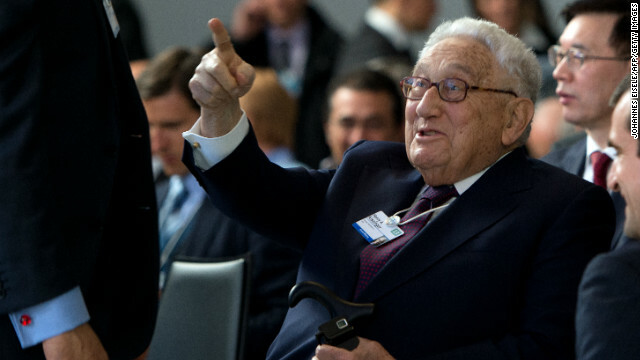 Former US secretary of state Henry Kissinger both spoke and attended sessions at the forum, as well as doing some obligatory finger pointing. 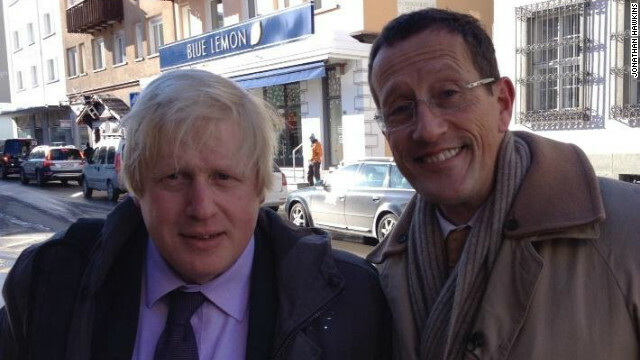 CNN's Richard Quest ran into London Mayor Boris Johnson on the streets of Davos. 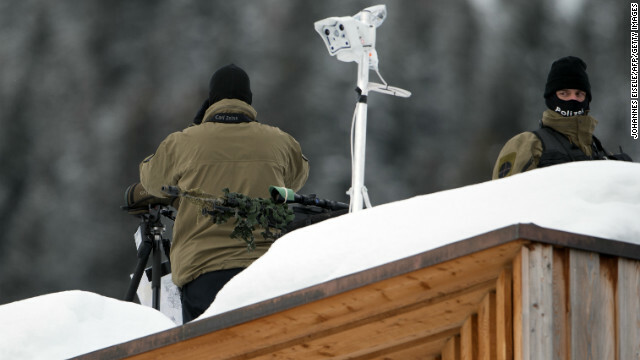 Policemen stand guard on the roof of the congress center in Davos. 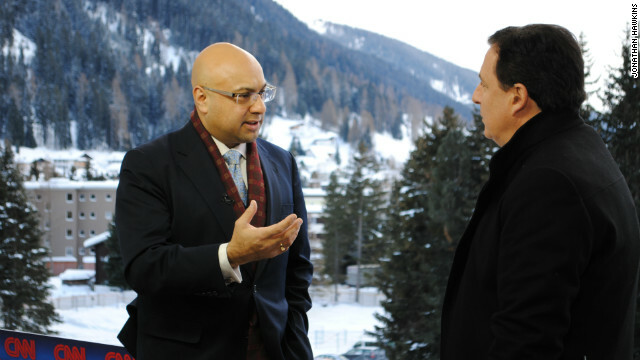 CNN's Chief Business Correspondent Ali Velshi endured both freezing temperatures and snow storms whilst reporting from Davos. 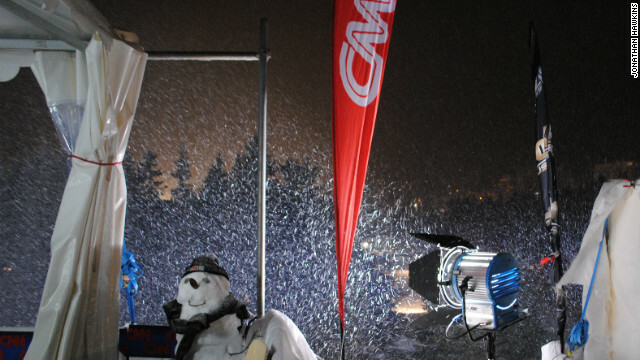 The CNN snowman chills out after a hard day at work. 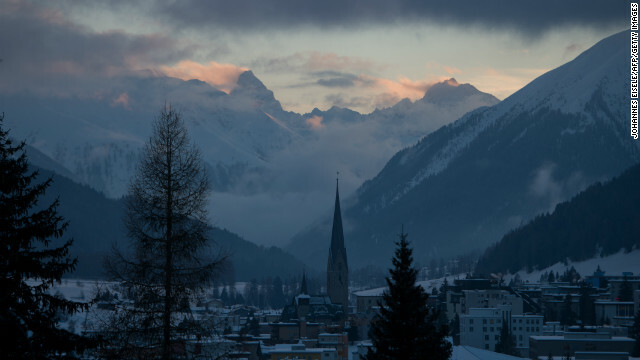 The Swiss resort of Davos first hosted the World Economic Forum back in 1971 when a group of European business leaders met under the partronage of the European Commission and European industrial associations. Of course, I am always the one to instigate it, but it does just take one person to get the conversation flowing. On Wednesday night, post dinner, I met the Dean of the Said Business school in Oxford. Last night, I was lucky to start a conversation with the head of Standard & Poor's. The beauty of the shuttle is that no one knows anyone, so conversation normally begins with "Are you enjoying Davos? When did you get here?". Midway through the journey, if you're lucky enough to be stuck in traffic, then will you get into the most important question: "What do you do?". That's when I smile and they frown. I get excited that I have met a CEO, a vice president or the head of an NGO. They are disappointed that I'm a journalist. I'm quick to tell them that I'm not working and that everything is off the record. In cases such as this, when you have all of five minutes, it's crucial that you show your journalistic integrity and present them with a picture of a person rather than a journalist. I always think to myself: "Don't force it, be natural." This attitude has enabled to me make more contacts than on any other occasion. During a half hour shuttle journey on Thursday, I met a New York hedge fund manager, the chairman and CEO of Bayer, the VP of a Norwegian bank and many many more fascinating people. In true traditional networking style, they exit with well wishes and all, without exception, hand out their business cards. So forget LinkedIn -- come to Davos and the shuttle.